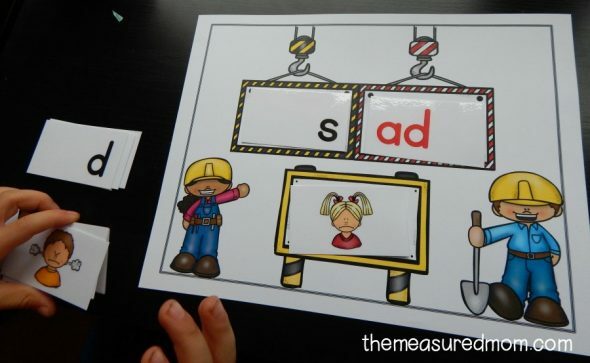 Are you looking for a fun activity to help kids sound out words? My preschooler loved these! Over the past year, I’ve been doing a lot of pre-reading activities with my Four (almost five). 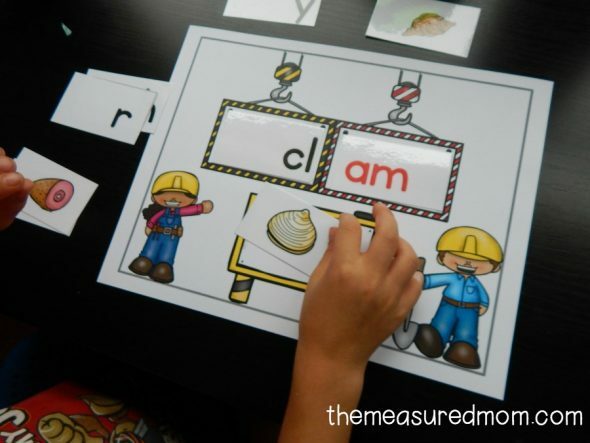 We’ve read pocket chart sentences, used my voice to print packs to learn concept of word, and are even starting a simple reading curriculum for preschoolers. He’s got concepts of print down. He’s starting to learn simple sight words. But sounding out words? That’s a tough one. 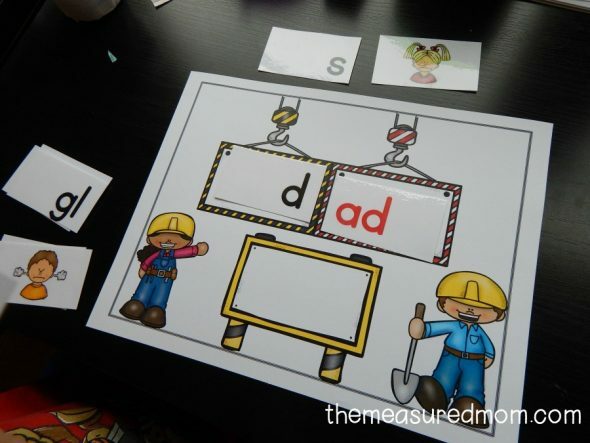 I created this activity without an expectation that my son would be ready for it. Imagine my surprise when it was just the thing he needed to get sounding out to “click!” Woo hoo! 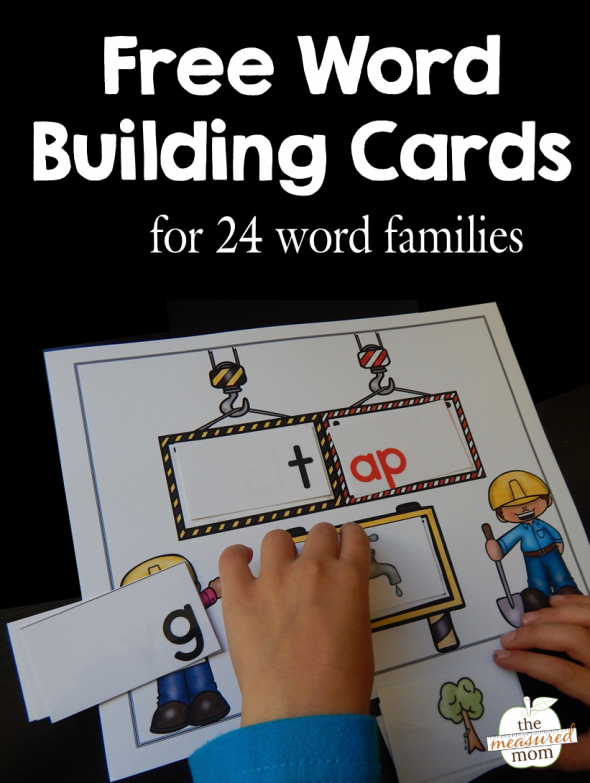 To play, simply print the word building mat and a set of cards and pictures. 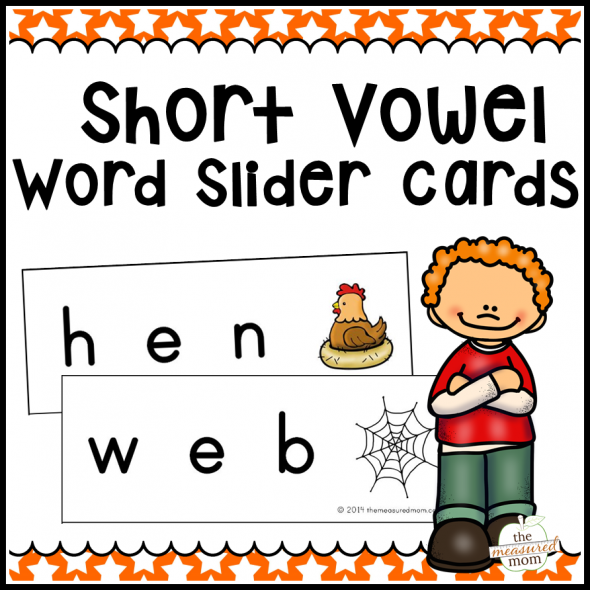 Each page in the download has five pictures and five beginning letters or blends for a particular word family. Help your child read the name of the word family. “Aaaad. Ad.” Next, he puts it in the red box (see above). Finally, he finds the picture that goes with the word and places it on the bottom sign. 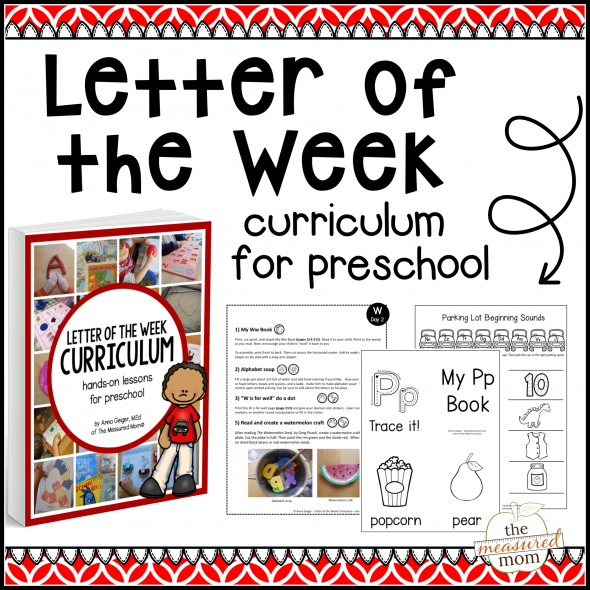 When done, your child can place the letter and picture in two piles above the mat. Then he starts over with a new word. When you’re done with one word family, try another one. My son did really well with the short a and short o word families. When I pulled out the short i word families, he quickly became frustrated. We put the activity aside for the day, but I’m looking forward to trying it again when he’s ready. 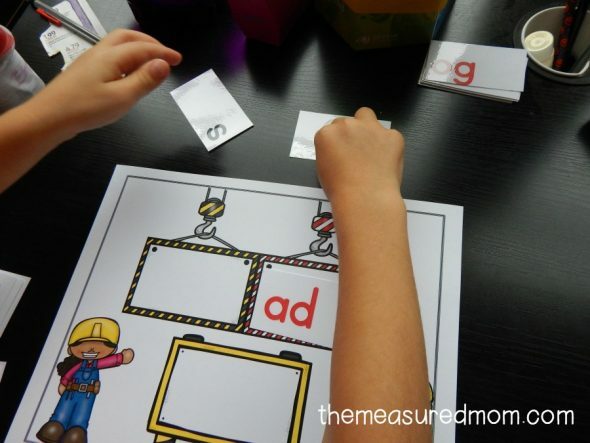 After you laminate each page, cut apart the letter cards and pictures. Bind each set together with a rubber band, and store all the sets in a quart or gallon size freezer bag. Depending on your child’s ability, do just a few sets at a time. If you sense frustration, be careful not to push too hard. Stop early if necessary. Start with the easiest word families. In my experience, kids learn word families best in this order: short a, short o, short i, short e, and short u. 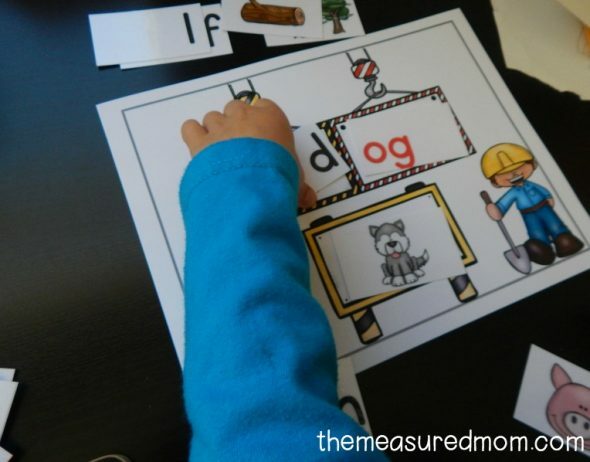 When your child can build the words on the mat quite easily, set the mat and pictures aside. Pull out a word family set and build a word, such as “cat.” Quickly place a new letter card at the beginning of the word ending. How quickly can your child read bat, hat, and mat? 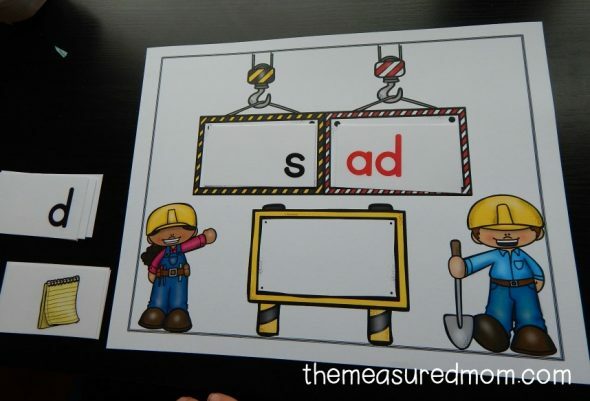 Try some of my other early reading printables to help your child grasp “sounding it out.” Browse my free printables page or purchase bundle packs pictured at the end of this post. 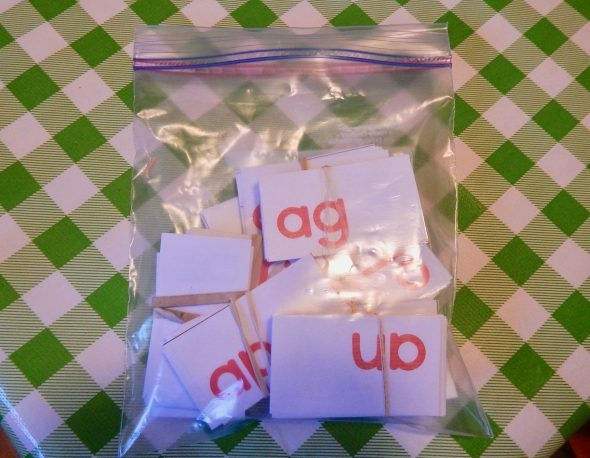 Try these bundle packs for more practice sounding out words. Thank you so much for your kind words, and I hope you get to use these! They’ve worked really well for us. I’m so glad you’re part of our group, Cathie, and I hope you keep finding useful resources! Anna, this is fantastic! I have a four-and-a-half year old boy that will soon enjoy this activity. It is just the perfect thing for him. Thank you very much. Your website is gold for me, and I appreciate all of your quality materials. Yay – I’m so glad you can use these, Ginette! Once again, this is a wonderful resource! Thank you, Anna, for all that you do in making our lives easier. Your website is fantastic. Wow these resources are fantastic 🙂 Thanks a lot!! I sincerely thank you for all your lovely resources. They are wonderful. God bless you and all your work. Fabulous! Thanks for your dedication and sharing your hard work! THANK YOU SO MUCH, YOUR KINDNESS IS APPRECIATED. THESE ARE TO HELP MY GRANDSON BECOME A BETTER READER AND HE LOVES ALL THE ACTIVITIES YOU HAVE GIVEN US ACCESS TO! I’m so glad your grandson enjoys these, Jeni! THANK YOU so very much for your great ideas. I have to pay for what I find online so it’s nice to find high quality activities that are free every once and awhile. My kindergartners appreciate you and the fun that they have while playing with these activities! You’re very welcome, Cory – thank you so much for the comment! I’m so glad to hear your kindergartners are having fun with my activities. I cannot say Thank you enough for your amazing work! Thank you Anna for all the resources. I live all the way in Kenya, Africa and have two young children, and I also run a kindergarten; you have been of great help; much appreciated. Thank you again. You’re very welcome, Diane! I hope you find many helpful resources on my site! I am so excited to use this with my class! I have been using your resources for the past three years and they are all such high quality and save me so much time. Not only are your resources clear and easy to use, but my students ALWAYS love them. I can’t thank you enough for all of the work you have put into this! Thank you so much for your kind comment, Beth! It really brightened my day! Thank you so much for sharing these wonderful resources with the world! I work with Deaf and Hard of Hearing oral students that are sometimes struggling to hear all of the sounds or maybe hearing sounds for the first time. Your resources are engaging and fun and I am totally addicted to your site. Can’t wait to use the new things I just downloaded with my students. Your work is greatly appreciated! I’m SO happy to hear that you can use my resources, Sheena! Thanks so much for this encouraging comment! Trust me, these teaching aids and your dedication inspire me so much and everyday I’m entering my class with variety of flashcards which really help my kids to improve in English. Thank you. Thank you for sharing this resources.It’s colorful and my twins nephew and niece will motivate to read because of this.God Bless you!